So, as you guys know, most schools in Bangalore have closed for summer vacations and so has my daughter’s school. You guys also know how much I believe in activity based learning and getting involved with her. We have been doing a lot of fun activities in April both at home and outdoors. During this time, we visited a new mall in our neighbourhood, the Virginia Mall in Whitefield. It is a walkable distance from my home and there were so many interesting ads detailing the huge range of games, activities, food and drinks on offer so it was obvious that we had to visit. The one thing in particular that we were quite excited about is the new entertainment centre in the mall. It is called IONA and it looked like it had a lot to offer. After checking out all the great selection of activities available, we quickly realized that #IonaFunKaBoss had so much more to offer than our initial expectations – especially for my daughter – and we both thoroughly enjoyed the experience. We have now visited it multiple times and come back happy each time. 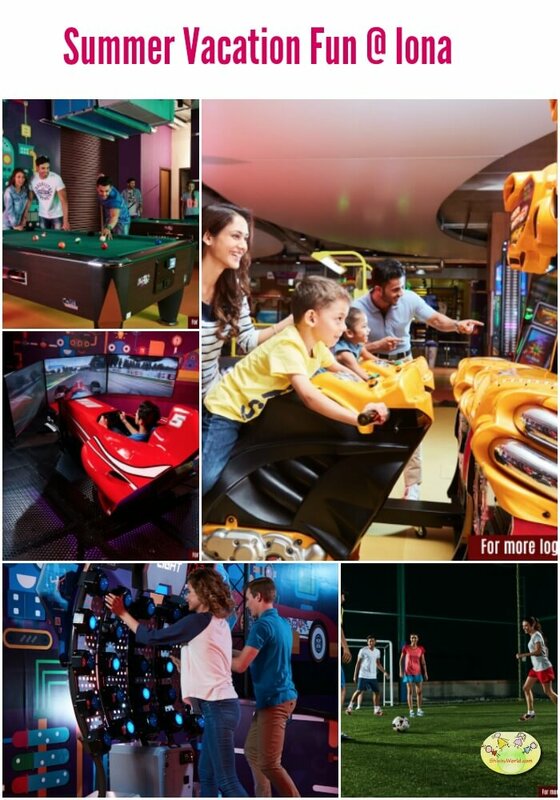 What differentiates Iona from other entertainment centres is the wide variety of sports and gaming options, not just for the children but for adults too. It is huge and spread over 3 storeys and has some entertainment for visitors of every age. So, when we visit it as a family, it is not as if my mum or mum-in-law are getting bored, just sitting and waiting. There is so much to choose from at Iona for everyone, but I will list out a few of our favourites. This has to be perhaps the most popular activity, Iona has to offer. India’s first Clip n Climb Zone, it is the only place in Bangalore for indoor rock climbing and rappelling. Kids just love getting into a harness and then climbing the three storey high indoor rock. It is also good for adults and I can just picture many offices conducting their team building activities there. robotics for a 7D cinematic experience like no other. Suitable for kids over 8 years and adults. My 9 year old nephew had a great time there and so does my hubby dearest. There is something about men and cricket, so it is natural that men should gravitate towards this interactive one-of-its-kind 360 degree cricket simulator, where you could challenge the best bowlers in the world and get accolades and money if you win. To top it all, they now have the inimitable Chris Gayle as their official brand ambassador. Can’t wait to see him when he visits Bangalore. If you love sports, racing and competing with your friends, then Iona has many things to offer to you. They also have Multi Sports Pitch, specially made imported turf to play multi sports like Box cricket, Tennis, Hockey, Badminton and more, I could see many having a whale of a time there.. Ticket Monster is the same great game as the very popular Big Bass Wheel. This is really a game of pure luck and we do try it most times. My mother was very happy to try this. Do you like Minions? Do you like hammering? Well finally these things have been combined to make the ultimate in banging naughty Minions with a big Hammer game. I love hammering those naughty minions every time we visit there. Other than all the adventure, their play zone for young kids is also so much better than any other I have seen. My daughter absolutely loves going there and we just HAVE to visit it whenever we go to Iona. It has a variety of activities and all the safety features needed for the young children to play freely in a safe environment. We haven’t seen it yet but have heard that Iona is the first entertainment centre in South India to get two rooftop football pitches. Just book in advance, get your mates or form an office team and have a blast. 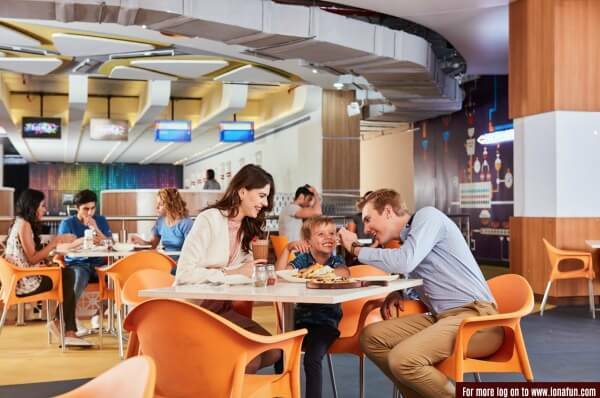 Once you are done with the adventures and the games, there is also a cafe huge food court offering lots of selections from India and beyond and a bar to cool down with some refreshing cocktails or a bucket or beers to savour with family and friends alike. Visit www.ionafun.com for bookings, contact page and more!